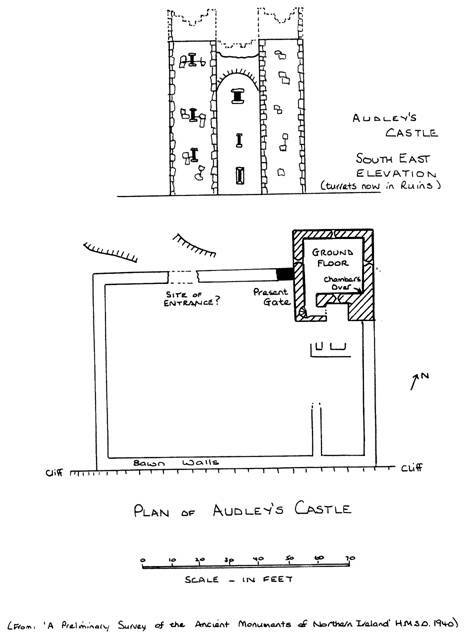 This article contains such information as I found out about Audley’s Castle, Co. Down, and the ‘Lecale Audleys’ during the time when my husband and I were joint-caretakers of Audley’s Castle from 1971 to 1987. Lecale is that part of County Down east of Downpatrick and Dundrum, having Strangford Lough and the Irish Sea on the north, east and south coasts. It is very beautiful, rural with small fields and low hills. Full of things ‘historical’ and, as the Normans held on to it throughout most of the Middle Ages, it was not ‘planted’ in Elizabethan and Jacobean times. The Audleys lived in the castle until the mid-17th Century, when the last recorded Audley sold his land to the Ward family (subsequently Lords Bangor). The Wards absorbed the castle and part of the Audleystown lands into their desmesne of ‘Castleward’ - and by the 1830s their estate had been landscaped, using Audley’s Castle as a focal point at the end of their lake. Local tradition has it that the last Audley married one of his tenants and “lived no better than them”. In the late 1840s, continuing their landscaping programme, Lord Bangor demolished the little settlement of Audleystown. The unfortunate tenants were shipped off to America and the Bangors planted Audley’s Woods over the fields. 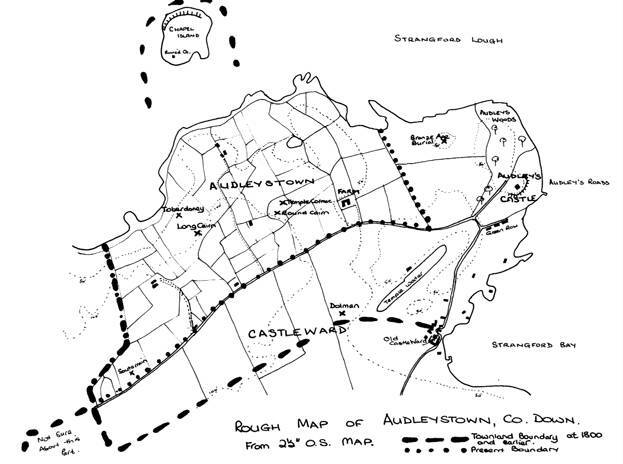 So today there is an ‘Audley’s Castle’, ‘Audley’s Woods’, ‘Audley’s Roads’ (the deepwater anchorage below the castle, a traditional haven from the dangerous tides of Strangford Lough Narrows), ‘Audleystown Farm’ (one of the three farms in the townland) and ‘Audleystown Townland’ itself (about half of the size which it was in 1800). In nearby Downpatrick one of the electoral wards is called ‘Audley’s Acre’). Several old Norman family surnames still occur in Lecale, including Fitzsimons, Jordan and Russell, but there are no Audleys in the district, and the surname appears only once in the Northern Ireland telephone directory. Most reference books say that the Audleys came into Ireland with John de Courcy, though I have only come across Audleys in connection with de Lacey. All the four sons of Adam d’Audley seem to have come over to Ireland. The two younger ones, Luke and William, held Carrickfergus Castle, on the north shore of Belfast Lough, for de Lacey against King John (1210). John had marched north from Dublin and had camped overnight in Downpatrick (a field near the Racecourse is still known as Kingsfield) on his way to Carrickfergus. Carrickfergus surrendered to the King and both William and Luke had their lands confiscated, though these were restored to them in 1217. I do not know if either of these men held land in Lecale, but their brother Henry (the Henry Audley) certainly did. Henry is generally supposed to have built the first wooden castle here (just as he built Heleigh and founded Hulton Abbey). The ‘Preliminary Survey of the Ancient Monuments of Co. Down’ published by H.M.S.O. in 1940 interpreted the scarping of the sides of the rocky hillock on which Audley’s Castle stands as evidence of an earlier motte-type castle. Henry died in 1246 and his son James, who became Chief Justiciar at Dublin in 1271, and died in the following year, inherited Henry’s Irish lands. Several of James’ sons were ‘slain by the Welsh’ and it is generally thought that the likeliest candidates as progenitors of the Lecale Audleys are the younger sons of Henry. Two are mentioned in the records by name, Adam (1248) and Henry (1257), though it is thought that there were others. Unfortunately, this is as much as I have discovered about the early Audley family in Lecale. In 1586 there was a John Audley living in the castle, a James Audley, Gent, was sitting on a jury in Downpatrick in 1613. James’ son, Robert, died in 1643 and his son, James Jun., sold a neighbouring townland (Ballynarry) to Bernard Ward in 1646. Shortly after this the Wards bought all the remaining Audley land in Lecale together with the castle. At this time the Wards themselves were living in a ‘tower house’, built about 1600, which is still standing, intact, in the Castleward farmyard. of a series of tower houses built around the Lecale coast during the next two centuries. The Castleward tower house is late, as is nearby Walshestown and the Quoile Castle near Downpatrick. There are tower houses in Strangford, Portaferry and Ardglass. By English standards, the tower houses are very small, just one room on top of another and very like the pele towers of northern England and Scotland. Usually three or four storeys high, with slit windows, spiral stairs (or straight stairs in the thickness of the walls), latrines in one corner-tower, steep gabled roofs (Audley’s has lost its roof) and a roof walkway. You can see across to the Isle of Man on a clear day from Audley’s roof walkway. The tops of Audley’s Castle’s four corner-towers have long since fallen (a series of watercolours painted by Mary Ward in the 1860s show the castle as an ivy-covered semi-ruin). A goodish portion of the NW wall had fallen by 1860, although a substantial gable was standing there 30 years previously. The Ministry for the Environment in Northern Ireland (Ancient Monuments Division) have re-faced the castle’s walls and inserted a wooden floor at the first floor level, paved the second floor level (which is open to the elements) and laid cobblestones on the ground floor. A semi-circular barrel-vault forms the ceiling over the first floor (the main living room). This is a typically Irish feature and is generally supposed to act as a fire-break to prevent the upward spread of fire. The vault was achieved by erecting a wickerwork centering, which was plastered over. The slit windows on this first floor have window seats, as did those on the second floor; the ground floor windows have double splay loops for a wider range of shot. The main door of the castle was guarded on the outside by a high machicolation, and on the inside by a ‘murder hole’. I have not found any written evidence of the castle being attacked, but in the 1950s archaeologists found an arrow-head embedded in a wall near a window and evidence of a mass burial at the foot of the escarpment slope. Medieval County Down was as turbulent as anywhere else! There has been a 9’ high bawn wall (courtyard) around Audley’s Castle, the castle itself being in one corner of this enclosed bawn. The lowest couple of feet of this wall still exists and also a remnant of an outhouse. This area is now grassed. The Lecale Audleys, in their little tower house, were a junior branch of the Audley family. The senior branch settled in the south of Ireland after selling up the North Staffordshire estates in the 17th century. They were created Baron Orier (in Co. Armagh) and Earls of Castlehaven (Co. Cork) in 1616 and lived in the Castle of Ferns, in Wexford. This was not, it seems, a very comfortable place, being much run down, if not actually semi-ruinous by then. One guest complained that it was “but meanly kept” and the Earl “loves not hospitality”. However, during King James I’s reign, this Earl, George Tuchet, undertook to take part in the great plantations in Co. Tyrone. In 1610 he acquired 2,000 acres - about 34 small townlands - around what was to become Omagh town. Interestingly enough, he called his new estates “Heley”. Other members of his family received smaller amounts of land. Ultimately, the government took all this land from the Earl on the grounds that he was negligent, under-funded and had too many “native Irish” tenants. His son and heir was called Mervyn Touchet. James Touchet, 3rd Earl and son of Mervyn, served as General of the Irish Forces for Charles I in the Civil Wars. He led 1,500 men into Wexford against Cromwell. James’ nephew, another James, the 5th Earl, fought at the Battle of the Boyne - for King James against the Williamites. In 1966 the Ministry published the comprehensive ‘Archaeological Survey of Co. Down’. The researchers for this went around Co. Down listing sites and what was known of their history. Local people, especially the farmers, pointed out sites which they had on their own land which few other people knew about. Hence within Audleystown Townland there is a long cairn (Neolithic, containing the remains of more than thirty people, and incidentally the earliest known horse bones in Ireland), a round cairn, a dolmen, a souterrain, a single Bronze Age burial and a very early (5th century?) Christian church called Temple Cormac. Cormac was a particular friend of St. Patrick. A part of the townland was always called Toberdoney, meaning Donard’s Walls, possibly another early Christian site. The surveyors working on the Preliminary Survey suggested that the bawn wall at Audley’s Castle may have been part of a second castle - a large stone tower intermediate between the wooden motte castle and the present tower house. It was odd for me to have come from Audley, Staffordshire, to Audleystown, Co. Down, to caretake Audley’s Castle and then to move into Downpatrick and a house in Audley’s Acre. We found the castle quite by accident on a drive around the countryside, not knowing of its existence beforehand. Incidentally, the Wards of Castleward came from Capesthorne Hall, Cheshire. (It was a Miss Ward who married a Bromley-Davenport.) The Wards came to Ireland as Surveyors General to Queen Elizabeth. They bought their lands and were not Planters, living on their estate and running their property on English lines. The National Trust took over Castleward in the mid-1950s, following the death of Lord Bangor. His successor was that Edward Ward who used to be a correspondent of de Reuters and the BBC. Recent American visitors to Castleward recalled, as GIs stationed in England, listening to his description of wartime battles on the wireless. During our years as caretakers at the castle, it was our duty to lock and unlock the castle daily ‘during normal visiting hours’, to keep it clean and tidy and cut the grass within the bawn wall. It is in the care of the Ancient Monuments Division of the Ministry of the Environment and is surrounded by the Castleward Estate, now owned by the National Trust. The castle is much visited by local schools and the many visitors to Castleward, as well as by visiting yachtsmen from around Strangford Lough and further afield. What was a strategically important site, with wide views over the Lough Narrows and beyond, is a popular picnic place these days. This is as much of the Audley’s Irish connections as I have discovered. The accompanying sketches of the castle are taken from a small pamphlet which the Ministry of the Environment produced. In our caretaking days we were often asked by visitors who the Audleys were. Everyone was curious to know the origin of the castle’s name and there really is very little written about them. I hope this is of some interest. When I lived in Shraley Brook, until 1962, what the Audleys did after they sold their North Staffordshire lands never interested me at all. I wish that I had made better use of the Pipe Rolls and Fine Rolls, to which I once had access in Manchester University’s library. Thank you so much for your kind and interesting letter. As you know from my family tree, I came into the title rather unexpectedly and late in life so have not had the oportunity (sic) to visit Audley and Heleigh Castle which I would dearly love to have done. Regretfully I now find travelling any long distance a difficult matter. I believe that there is also an Audley’s Castle on the north coast of Ireland that I would also loved to have had the chance to see. AUDLEY - RICHARD MICHAEL THOMAS, 25th Baron, peacefully on June 27, aged 83. Much loved husband of Pauline and beloved father of Patricia, Jennifer and Amanda. Funeral Service at St Mary Magdalene, Cowden, Kent on Monday, July 7 at 2.30 p.m. Family flowers only. Donations, if desired, to St Andrew’s Home, Stick Hill, Edenbridge, Kent.